GUEST BLOGGER SERIES: Gustavo Arellano "Gringo de Mayo"
You are here: Home / Uncategorized / GUEST BLOGGER SERIES: Gustavo Arellano "Gringo de Mayo"
Latinovations thanks today’s special Cinco de Mayo guest blogger, Gustavo Arellano. This piece originally appeared in the OC Weekly. 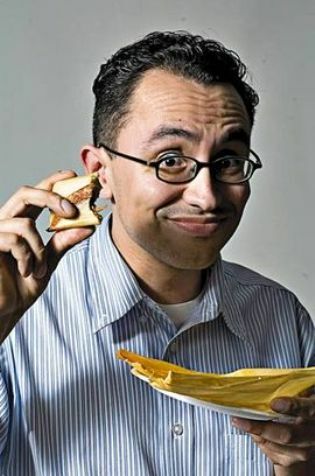 Become a friend of Gustavo’s on Facebook to keep up with his latest “Ask a Mexican” columns. Cinco de Mayo is ridiculous. It’s not pointless because it serves the nationalist project of promoting pride in a country and its culture. And it isn’t worthless, since it has worked like a charm in making Mexicans out of all ethnicities come May 5, even if the extent of commitment toward México lindo y querido is drinking Corona instead of Coors. But celebrating Cinco de Mayo is ridiculous because it commemorates a victory that ultimately meant nothing. Sure, General Ignacio Zaragoza and his troops held off the French that glorious day of May 5, 1862, in Puebla, but the Mexican triumph was short-lived. When the French and Mexicans fought a year later on the same battlefield, the French whipped some Mexican pompi and ushered in a five-year occupation under the Hapsburg Maximillian. I write not to diminish the actual event; Zaragoza’s impoverished soldiers deserve our admiration for decimating what was then one of the world’s best armies. But celebrating Cinco de Mayo is like remembering Tennyson’s “Charge of the Light Brigade” for the charge while conveniently forgetting the massacre at the end. Many people regard Cinco de Mayo as a celebration of resistance to imperial power. If only that were so. The events of that day didn’t prohibit the French from turning Mexico into their Latin American playground. Mexicans taste the French legacy every morning in their pan dulce and tortas. Teenagers listlessly practice it in quinceañera waltzes. Men yelp their approval to our French conquerors whenever the mariachi violins begin their pizzicato coda. There’s something there. Strangely, Mexicans enjoy harping over the country’s inability to defeat foreign aggressors. Look at the examples: The Mexican government bemoans the Conquest nearly 500 years later, simultaneously outraged that Spaniards slaughtered and raped the inhabitants of Anáhuac and angry that Montezuma acquiesced so quickly to Cortés. The annexation by los pinche americanos of half of Mexico 150 years ago because of General Santa Anna’s idiocies still makes some Chicanos so miserable they start comparing themselves to Palestinians. (Palestinians! As if someone who speaks horrid Spanish, has parents born in Jalisco that are descended from Europeans, and hasn’t lived a day without potable water can logically compare himself to people who have lived in the same parched spot since the time of Christ.) That pretty pochoOscar de la Hoya beat the Mexican hero Julio César Chávez—twice. And let’s not talk about the underachieving Mexican soccer squad. According to Paz, the only way to live with such a bitter legacy is to party. And Cinco de Mayo is Paz’s ultimate example of celebrating to forget—even if it promotes a lie. Mexicanos al grito de guerra:let’s confront our perpetual self-pity and stop the Cinco de Mayo celebration. Napoleon III was an egomaniac who, during his lifetime, launched France’s imperialist adventures in Indochina and Africa in hopes of emulating his uncle. (For a great portrayal of how loony the Third really was, check out Claude Rains’ hammy performance in 1939’s Juarez.) The Maximillian-Carlota reign in Mexico is best remembered as two royals so desperate for adoration they sailed halfway across the world to find it among peasants. Yet we celebrate the memory of their conquest over us every May 5 by claiming we defeated them. That’s ridiculous. Add Gustavo as your friend on Facebook! Gustavo Arellano’s popular Orange County Weekly column “¡Ask a Mexican!” is widely syndicated, answering serious, curious, and sometimes hateful but mostly irreverent questions about Mexicans. It was first published in 2004 as a one-time spoof, but it ended up becoming one of the weekly’s most popular columns. Every week, readers submit their questions based on Mexicans, including their customs, labor issues, and illegal immigration. Arellano responds to two queries a week.